...along with this brand new autographed copy of New England Knits contributed by Melissa LaBarre! It was my pleasure to feature Knitterella gift tags as well as to share a knitting story from Melissa in my latest podcast episode. Click here to listen! To enter this giveway, please leave a comment (with contact information) under this blogpost. I will be announcing the winner on December 15th, so please check back then to see if you have won! Drawing now closed! Congratulations to Maria, the winner! I love her gift tage and could really use them this holiday season! these gift tags are an awesome idea! Those tags are too cute! Thanks for the giveaway. The tags are absolutely adorable. I'd love some. My ravelry username is joyatee. Oooh how fun :) Thanks! Gorgeous book and I love the gift tags! What a super giveaway, thanks! Oh, I'd love to win the lovely tags and the book! Love your stuff! Thanks for the great giveaway. Oh my gosh! Adorable! Thanks for the opportunity to win! I've never since just pretty tags. And I love that they have the care instructions on the back of them. I don't knit many gifts but i would really have to get this tags if I ever made anything special for someone other then my bf. Love those tags!! Thanks for the giveaway. Fantastic prize. Fingers are firmly crossed here! I just lusted after those gift tags today! The gift tags are so neat! And that book has beautiful designs. Cute! I love those tags, and who wouldn't want a copy of that book. Thank you! Ooh, those are great -- the gift tags and the book! The gift tags are great, I love the funny ones. Nice book too. I love those tags. I definitely could use them! Those are so cute! What fun it would be to win! Those gift tags make me laugh I think they are a great idea. Wonderful giveaway. Great give-away. Those gift tags are wonderful! Hee, hee! Those beautiful tags make me giggle! Thanks for the giveaway. Me, Me, Pick me! Thanks for the contest! I love the tags. They are adorable. And the book, also. Cute and funny tags. I would love to use them with my homemade christmaspresents. Cute tags. And the book is amazing. Such an amazing giveaway. Oh my gosh those tags are awesome! Oh they're gorgeous! Fingers crossed! Cute tags, and the book looks great - thanks! I love her tags so much - they are perfect to give as a contest. I love this (plus she's a fellow Michigander)! Me, please. Knitasha1968 on Ravelry. What a great way to add a finishing touch to my knitted gifts! Your tags are such a good idea for this holiday season. oh these are so great! Another great give away. 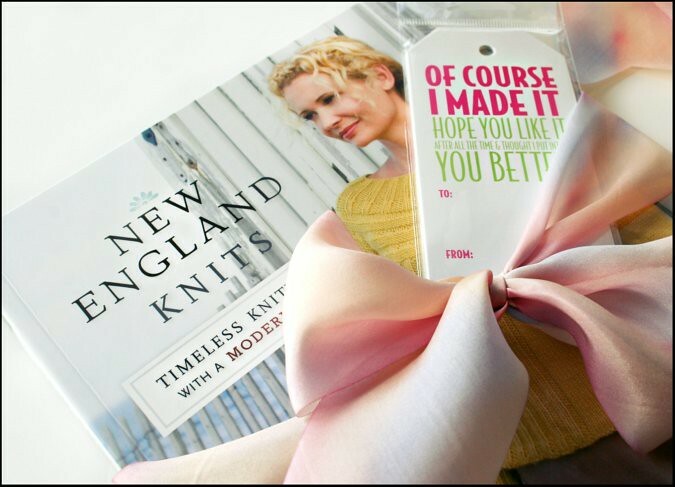 New England Knits has great patterns and the gift tags are such a great idea. What a great giveaway. My ravelry name is basketballknit. I've heard great things about this book and super cute tags! Love the tag that reads: "I made this especially for you even if you don't like it please act like you do"
I would love the gift tags! And book! The tag design is just great! Having finally caught up and listened to every single one of your podcasts in the month of November, I was DYING for this episode to be released. Thank you for this amazing giveaway! I'm crossing my fingers. Those are so adorable! Thanks for this opportunity. Wow, I was just checking that book out - and as for the tags - perfect for gift-giving. Gret give-away! Oh! This book is definitely on my wishlist this holiday, what a nice gift it would be to get it early! Thank you! Those tags are great. The book is really nice, too. Great gift tags! Very clever! What an awesome idea these gift tags are. Love the tags...and the book, of course! I've been longing for this book. And of course, Kniterrella's tags are great. Off to listen to your podcast! Gorgeous book and gift tags! Thank you! Adorable tags and a great book - I love that Hampton Cardigan! Thanks for another great giveaway! I have always loved those tags. Thanks for the terrific giveaway (again!). The tags are so cute and the book sounds fantastic! Oh Boy, could I really use these they are so cute, and would make a great addition to my hand knit. The book would be great for my library. I adore her gift tags, but I'm on a bit of a budget and have never have had a chanse to purchase any. Those gift tags are fantastic! Hadn't seen them before; thanks for sharing. I love the concept of the gift tags! Making a handmade present even more special. Great book too! Absolutely love the photo with the bow around your tags and the book! I love those gift tags. And I've been eyeing up that book for awhile now. Thanks so much! I love the tags and have checked out the book from the library--It's great! My ravelry username is bonniebeth. I love the gift tags...much much elegant than my hand written tags. I LOVE Knitterella's products. And, I'd love to win some. oooooh... a great giveaway. I'd love to win this one. Just beautiful! All of it! What a wonderful idea for a giveaway at this time of year! Thanks to you and your sponsors for all this fun. cute tags! StephCat on Ravelry. The gift tags are a riot. My ravelry username is knitteryninja. I love these gift tags! Perfect for all the gifts I make. I would love to.win these great products! Love them! Oh, what a perfect time of the year to win gift tags! I'd love to win the tags and immediately regift them at Christmas. My friend has started the whale hat and I am so jealous. Those are fantastically clever! LOVE them! I love the gift tags. How cute! The gift tags are wonderful! And the book, wow! Thanks for the giveaway. How lovely they are and how generous you are! Yet another awesome giveaway! Thanks. I have just the people and knitted gifts for those tags! Always looking for tags for my knitted gifts. These are great! Love the gift tag sayings. They are super cute! Thanks for the giveaway! LOVE those gift-tags - they are perfect for knitterly gifts especially at christmas!Great giveaway! Ooooh! I just love these tags! In a word FABULOUS! A new knitting book is just icing on the cake of a fabulous giveaway. Those gift tags are great! Thanks for the giveaway! Those gift tags are great and I see that there are some of the new ones in there with care instruction options on the back. A very generous giveaway, yet again! What beautiful tags. I have been looking for the perfect tag and these are them. I've been eyeing that book for some time and Love the Tags, good idea! Those gift tags are sooooo cute. And that book, like that too. Ooooh!!! Super cute and functional! 2 things I love! ourfilecabinet(at)yahoo(dot)com. Happy Holidays! Love those gift tags and the book looks like a good one! I would love to win them! Knitterella has super cute tags. I would love to win! The tags are great and I would love to win the book. Thanks for the giveaway. Those are so sweet! And I am drooling over that book!!! Great tags and book! I would love to win them, and would come in very handy with all the made gifts. New England Knits would be "Florida Knits" for me and I would LOVE IT! What a fabulous give away! consider me entered. I'd love to win both! Thanks! I ♥ Knitterella's tags! And the book! Pick me! Pick me! Nice tags! Perfect for my christmas presents! Great book! LOVE both of these, was just looking at these tags yesterday online, they are terrific! The Knitterella gift tags are soooo funny! The book is a must-have too. Thanks! Great way to give gifts to others. Sounds like a great book to own, especially with winter approaching! Thanks for the giveaway. The gift tags are awesome! Those would be perfect this holiday season, as I'm making a lot of my gifts to people. Thanks for the opportunity to win! 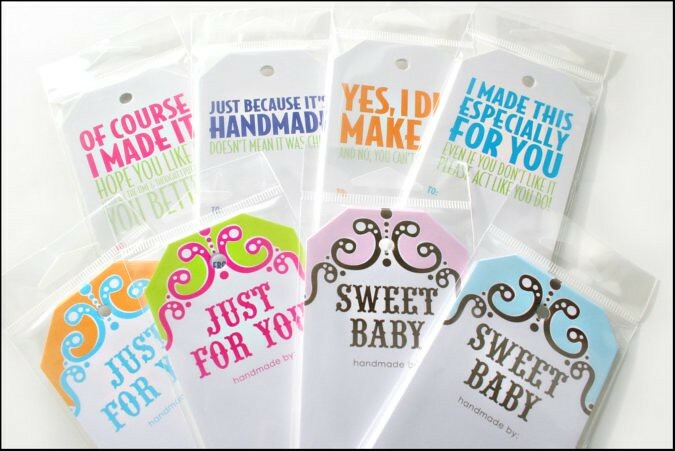 Oh I love those gift tags...I was thinking about getting some when I saw them online the other day! Thank you Alana for another great giveaway. the tags are beautiful! I will be purchasing even if I don't win! I love the Auburn Pullover from New England knits! I would love to have a copy to fit it into my plans for the coming year. This would be a great one to win, and if not I'll have to look into her tags anyway since I've knit everyone in my family something for the holidays this year. I especially like the one that says something along the lines of 'you better like it' cause seriously, I think my fingers need therapy after all that knitting! And I've had my eye on the New England Knits. Thanks for hosting such a fun give away! ordered some yesterday, but a girl can never have too many! I am waiting for my library to get that book! The tags are great! So is your podcast! Those tags are fabulous!! And the book is lovely! I could use some great gift tags! Thanks for the opportunity. That is an awesome giveaway! Thanks! Those are the cutest tags! Thanks again for sharing. These gift tags are perfect for the holiday season. Ooooh I really want to win this giveaway. Thanks for the giveaway! Just in time for gift giving! Knitterella's gift tags are beautiful and funny. Thanks for the giveaway! Autumn Vines Beret Pattern- In Print!